A spider is basking on the bathtub’s white porcelain. Once upon a time I might have considered the malicious fun of surprising it with a spray of hot water from the shower and watching it slide down the drain. Today I gently cup the spider in an empty glass and walk it outside for release in the yard. Be well, Spider. You are not so different from me: you, too, want to live. In your own way, you, too, want to be happy and at peace. Much more than an occasional spider is vanishing. Because of humanity’s accidental or malicious impact on other creatures worldwide, great numbers of creatures are being lost, as are entire species. I imagine St. Francis of Assisi – the man who spoke of Brother Sun and Sister Moon – grieving the loss of kin, as members of his family disappear. I also imagine him looking around to see what he can do – what alliances he can forge, what actions he can take to heal the Earth community, human and non-human alike. 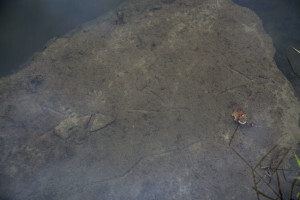 A place to begin is to save the individual creature that falls, hapless, into our hands. 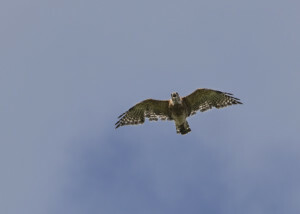 Then we look around to see what else we can do – maybe plant native landscapes and protect the habitats that shelter bees, birds, and butterflies; eat lower on the food chain; support organic agriculture; protect farmland and open space; and stringently reduce our use of fossil fuels. This morning a friend who lives in Northampton and who, like me, routinely drives 8 miles to Amherst and back told me that the next time she heads over there, she plans to take the bus. She has never taken that bus before, but after the rousing People’s Climate March in New York City, she knows afresh that she wants to do her part. Using public transportation rather than driving a car is one way we can help. I wonder how much more quickly the climate movement would grow if we who have financial resources encouraged each other to break our habit of over-consumption and waste, and turned our minds and hearts to protecting the web of life that is unraveling around us. There is so much worth fighting for and so much left to save. The Feast Day of St. Francis on October 4 marks the beginning of the first-ever Creation Season in the Diocese of Western Massachusetts. For the next 7 weeks, until the last Sunday of the church year (November 23), congregations will explore four ways to celebrate and safeguard the gift of God’s creation: Pray. Learn. Act. Advocate (a Web page offers suggestions and resources for each category). I hope to hear stories of breakthrough and experiment. If you are lucky enough to read this post in time and to live near central Massachusetts, you can celebrate St. Francis Day on October 4 at Agape Community in Ware from 10am – 4pm, at a gathering entitled, “A Vital Conversation: Integrating Ecology, Justice, and Peace,” with two gifted leaders of the religious environmental movement, Mary Evelyn Tucker and John Grim. For information about the event, visit here or email: peace@agapecommunity.org (phone: 413-967-9369). To honor St. Francis, you can also study a free online resource, “The Alternative Way of Francis of Assisi,” courtesy of Fr. Richard Rohr’s Center for Action and Contemplation, which writes: “Learn more about the Franciscan way of simplicity, compassion, and justice, from its historical roots to modern implications. Browse a wide variety of textual and media-rich perspectives at your own pace. Begin at any time and return as often as you like. No registration needed.” Visit here. 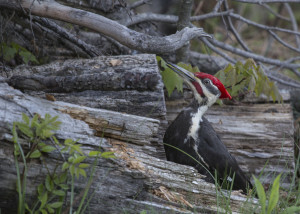 Are you looking for another way to celebrate St. Francis, who recognized that all creatures were members of one family? Here is a possibility: embrace the whole human family. Jesus loved not only the lilies of the field and the sparrows in the air; he also loved the outcast and the poor. Caring about the health and well-being of the natural environment involves caring about justice for the human poor. 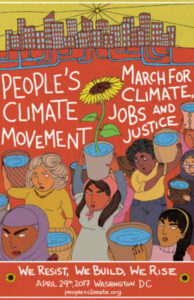 Stabilizing the climate and building a sustainable future is inextricably connected with working for social and economic justice. I give thanks for the strong coalition just now springing up within and around Springfield, the hardscrabble city that is third largest in Massachusetts. 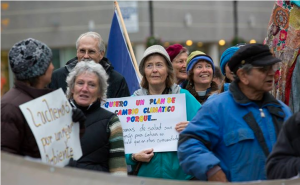 Over the past year, Arise for Social Justice, supported by Climate Action NOW, has been working to develop a climate change action plan for the city, which is the biggest urban polluter in the Pioneer Valley. The neighborhoods most affected by climate change – poor, Black and Latino – are forming a new coalition, which includes NEON from the North End, to advance their need to decrease air pollution and thereby to prevent asthma, emphysema and heart disease. More than one of every five children in Springfield is afflicted with asthma, a rate that is twice the average across the state. What do the under-served populations of Springfield want in a climate change action plan? They want more public transportation, more bicycle lanes and bicycle racks, more trees, parks, and community gardens, brighter and more efficient lights on public streets, more recycling, increased composting, and a stronger bottle bill, and “green” jobs for city residents. The people’s needs for good food, clean air and water, public health and public safety line up with what the Earth needs, too. On Monday, October 20, the Springfield City Council will consider a resolution that demands a Springfield People’s Climate Action Plan, which includes a provision for a staff-person to implement it. That night we will hold a march that begins at 5:00 p.m. from two separate locations: Northgate Plaza (1985 Main Street, which has plenty of parking) and Arise for Social Justice (467 State Street). The two groups will start walking and will meet on Main Street in downtown Springfield. United, we will walk to the steps of City Hall for a speak-out at 6:00 p.m., and then pack the Council meeting to share our passion for a cleaner Springfield. Will your organization become a sponsor of the march? To become a sponsor, you agree to publicize the march among your membership, to participate in the march, and to allow your name to be included in our publicity. 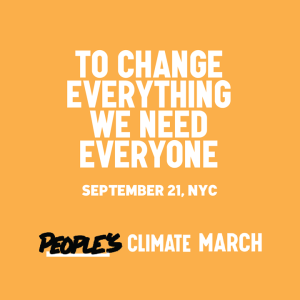 To become a sponsor of the March for a People’s Climate Action Plan for Springfield, please give your name, email address, and organization’s name to Susan Theberge (susantheberge (at) comcast.net). As I experience it, the Spirit of St. Francis – the Spirit of Jesus – is with us in our struggle to safeguard life as it as evolved on this planet. What shall we do with St. Francis? Pray, learn, act, and advocate. Save some wildlife, and hit the streets. It is a pleasure to be with you this morning, and I’d like to thank Molly, your rector, for inviting me. 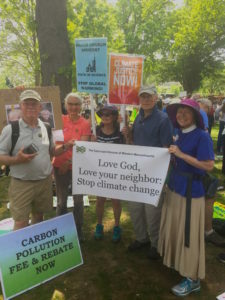 I serve the churches in this diocese as your Missioner for Creation Care, and I am just back from last Sunday’s exhilarating experience of walking through New York City in the People’s Climate March alongside literally 10,000 people of faith. 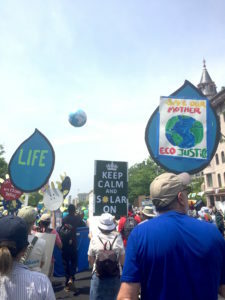 As you probably heard, the march drew a record 400,000 people from all over the country to express their concern about climate change. I’d like to speak about why Christians care so much about protecting the world that God entrusted to our care, and we have a wonderful parable to guide our thoughts, the parable of the two sons, which is found only in the Gospel of Matthew. We just heard the story: a father with two sons asks the first son to go work in the vineyard, and the boy replies, “Nope, no thanks. Not interested.” But sometime later he changes his mind, heads to the vineyard and gets to work. The father asks the second son to work in the vineyard, and the boy says, “I go” (Matthew 21:30). But he doesn’t go; he stays put. The question is: which of the two sons did the will of his father? The answer, of course, is the first son, the one who, despite his initial no, actually carried out his father’s request, not the son who said yes, but did nothing. What counts in the end is what we do, not what we say we will do. I confess that I smiled when I realized that this was one of today’s readings, for this parable means something to me personally. My son is now 24, but when he was a kid, I remember asking him one day to turn off the TV and go clean his room. “Sure, Mom,” he said, “I’m on it.” But he kept sitting on the couch, absorbed in the TV, and didn’t move. I gave him a couple more minutes and asked him again. Again he said yes, just a sec, sure, he’d go, but he kept on staring at the screen. I waited a while longer until finally – exasperated – I decided to tell him the parable of the two sons. Which is better, I asked: to say no but then do what is right, or to say yes and do nothing? With a hangdog look my son went off to clean his room. I was pleased about that, though I can’t say that my irritated lecture deepened his appreciation of either the Bible or Christianity. Still, I think there is something here for all of us to consider: this story invites us to notice the places in our lives where we know what the right thing to do is, but we’re not doing it, the places in our lives where our lips say, “Yes, Lord, I love you, I’ll do what you ask,” but our actions express something else entirely. We all have places in our lives where what we believe and what we do don’t quite line up, places where what we intend to do and plan to do and know is right to do somehow never gets done. We say yes with our lips, but our actions say no. It is a powerful moment, a moment of healing and integration, when our actions finally line up with our values, when we start doing the things that we know are right, when we say yes to God’s will and desire for our lives and then actually follow through. 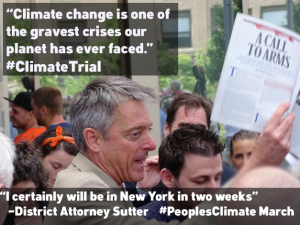 That is one reason why last Sunday I found the People’s Climate March so exhilarating. Here we had people of all the world’s faith traditions – everything from A to Z, Agnostic to Zorastrian, and people of every religion in between – Episcopalians, for sure, but also pagans, Jews, Muslims, Sikhs, Greek Orthodox, indigenous people, Evangelicals, Buddhists – you name it, the world’s religions were represented – and all of us, with our different rituals and different doctrines and different ways of talking about the Holy, all of us were saying yes: yes, we recognize that the living world of which we are a part is sacred and precious, and we take action today to heal and protect it. As I imagine it, it was as if members of all the world’s religions had in their own way heard God the Father say, “I need you to work in my vineyard; I need you to play your part in the urgent work of healing the Earth that I entrusted to your care,” and last Sunday members of all the religions said yes, and went out to the vineyard and got to work. Values and actions lined up. It was a day for rejoicing. 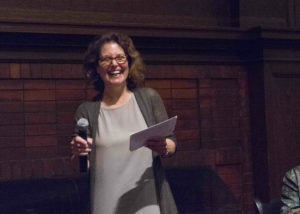 I’ve talked a bit with Molly, and I’ve heard many good things about how here at Christ Church you are already taking action to make care for Creation an important part of your mission and ministry. I’ve heard about your replacing throwaway, disposable cups at coffee hour with cups that can be washed and reused. I’ve heard about your community garden, which is a terrific way to build local resilience and food security. I’ve heard how several years ago you raised thousands of dollars to build a well in Liberia. I want to salute you for efforts like these, because doing our utmost to protect the ongoing web of life on this planet, and caring for the water and soil and air upon which our good health, and all life, depends is central to what it means to be a faithful Christian. In our Creation story at the beginning of Genesis, we meet a God who loves the Creation into being and who takes a look around at what he just made and is filled with delight. “God saw everything that [God] had made, and indeed, it was very good” (Genesis 1:31). The created world, the web of life that scientists call the biosphere, is created by God and reveals God’s glory. As the psalmist puts it, “The heavens declare the glory of God, and the firmament shows [God’s] handiwork” (Psalm 19:1). Land and rivers, animals, air and sea ultimately belong to God, not to human beings, for, as we also hear in the psalms, “The earth is the Lord’s and all that is in it” (Psalm 24:1). As humans we are part of the created order, not above it or separated from it, and the Book of Genesis tells us that the very first task that God gave to human beings was to take good care of the earth (Genesis 2:4b-8, 15). This is God’s Creation, not ours. We are here to shepherd and protect what is ultimately God’s possession, not ours. Well, we’ve got some hard work ahead of us in that department. Even a quick look at the news reveals how far humanity has fallen away from God’s vision of our species living in a loving relationship with each other, our non-human neighbors, and the rest of the natural world. Because of our burgeoning population, powerful technologies, and ever-expanding appetite for “more,” we’ve reached a point where human activities are unraveling the web of life. My particular concern is how humans have affected the global climate. As no doubt you’ve heard, climate change caused by human activity is already having far-reaching effects on the world’s continents and oceans, and the creatures that inhabit them. In only two centuries, we have pumped so much heat-trapping carbon dioxide into the air that atmospheric levels of CO2 are higher today than they’ve been for millions of years. A while back I heard a climate scientist remark, “We are breathing from an atmosphere that none of our ancestors would recognize.” Burning fossil fuels, such as coal, gas, and oil, at present rates could raise worldwide average temperatures between 5 and 11 degrees Fahrenheit in this century, which would make the world extremely difficult for humans and other creatures to inhabit. Already our planet is changing before our eyes: oceans are heating up and becoming more acidic as they absorb some of the carbon dioxide released by cars and power plants; tundra is thawing, ice caps are melting, sea levels are rising, coral reefs are dying, massive droughts are spreading in some places and heavy rains are intensifying in others. This past spring we learned that the huge West Antarctic ice sheet is starting to collapse and slide into the sea in a way that scientists call “unstoppable.” As the environmentalist Bill McKibben has written, “Our old familiar globe is suddenly melting, drying, acidifying, flooding, and burning in ways that no human has ever seen.” 1 Given the many pressures on the planet’s web of life, we are now in the midst of Earth’s sixth major extinction event. 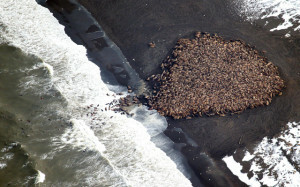 Maybe half the world’s species could vanish before the century is out. Our planet is 4.5 billion years old and has endured other extinction events, but this is the very first time that an extinction event is being caused by one species: us. We live at an unprecedented moment in human history, a moment when our choices really matter and what we do, or don’t do, makes all the difference to what kind of world we leave our children and our children’s children. What can we do? Well, we can recycle more, drive less, and be sparing in our use of water. We can turn off lights when we leave a room. Maybe we can eat local, organic foods and support our local farms and land trusts. We can install insulation, turn down the heat, and cut back on AC. As individuals we can and should do everything we can to reduce our use of fossil fuels, but the scope and speed of the climate crisis require action on a much broader scale, too. 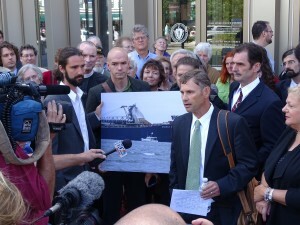 We need to join with other people and make it politically possible to do what is scientifically necessary. We need to push our political leaders to get this country and other countries on track to make a swift transition to clean, safe sources of energy like sun and wind. We need to quit our addiction to fossil fuels and bring down the level of carbon dioxide in the atmosphere to 350 parts per million, which is the uppermost level that many scientists say is safe for life as we know it to continue on this planet. What is the level today? Nearly 400 parts per million – and climbing. So we have work to do. Hope springs up when we take hold of that work and move into action. So I hope you’ll form a “green team” or a Creation Care committee (whatever you want to call it) here at Christ Church, and start to explore what you can accomplish together. I hope that those of you interested in building a network of people in the diocese committed to Creation care will give me your names, so that we can work together and support each other. I hope you’ll read the blog posts on my new Website, Reviving Creation. I hope you’ll take full advantage of our diocese’s first-ever Season of Creation, which begins next Saturday and lasts through the end of November. We are fortunate to have a bishop who recognizes what we Christians must do. I hope you’ll be thoughtful and creative and have some fun as you find ways to line up actions that express your values. The news from scientists is grim. But the good news, as we saw last Sunday, is that people the world over are finally beginning to organize, strategize, and mobilize. And the Gospel good news is that God is with us. God is with us. “God so loved the world” – literally, in Greek, the “cosmos” – “God so loved that cosmos that he gave his only Son, so that everyone who believes in him may not perish but may have eternal life” (John 3:16). The melting ice in West Antarctica may be unstoppable, but so is the divine love that made us, that sustains us, and that calls us to stand up for life. Jesus is among us now, offering us here at this table the nourishing gift of his presence and power. There is so much left to save, so much good that we can do, so many ways that we can help to build a better world. 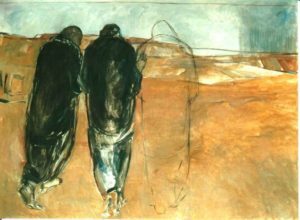 Like the two sons in the parable, we have a chance not only to say yes, but also to embody that yes: to go to work in the vineyard and to learn to live more lightly on the earth. As the poet Wallace Stephens once wrote: After the final no there comes a yes And on that yes the future world depends. 1. Bill McKibben, Eaarth: Making a Life on a Tough New Planet, New York: Henry Holt and Company, Times Book, 2010, p. xiii. I have been speechless for the past three days. OK, not exactly speechless. I have been immersed in email, so that counts as words. 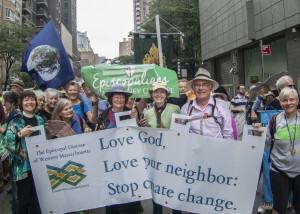 Some of the Episcopalians from the Diocese of WMA who came to NYC for the People’s Climate March (l. to r.): the Rev. Margaret Bullitt-Jonas (Missioner for Creation Care), Maria Dye, Mary McCarthy, Lucy Robinson, Mary Hocken, Jonathan Wright (partially hidden), Suzannah Fabing, Meg Kelsey Wright (partially hidden), Miriam Jenkins, Bob Hawley (partially hidden), Sandy Muspratt, Maryann Dipinto. But after the weekend’s “Religions for the Earth” conference in New York City, which brought together more than 200 religious and spiritual leaders from around the world to voice our concerns and commitments regarding climate change; after the conference’s powerful multi-faith service at the Cathedral of St. John the Divine; after the People’s Climate March on Sunday, which surpassed all expectations when 400,000 people surged through the streets of Manhattan; and after Flood Wall Street the next day, in which perhaps 2,000 demonstrators poured into the financial district and more than 100 people were arrested in a peaceful, passionate uprising to protest carbon pollution and carbon profits – after participating in all these events, any one of which would be enough to change a life, something deep within me fell silent. At a soul level, I had nothing to say. I wanted only to marvel in silence. I’m no Leo Tolstoy, but I understand such reticence. When for the first time you see something as deep, wide, and alive as an ocean, words fail. You want to gaze in silence. You want to bow with amazement and respect. Here’s what I can say, three days after coming home: I saw an ocean in New York. It was deep: deep in prayer. Deep in grief, conviction, and resolve. I heard an indigenous woman keen a lullaby to the children of the future who may never be born. It was wide: brimming in size and wildly diverse. It wasn’t just the numbers that took my breath away – it was also the diversity. 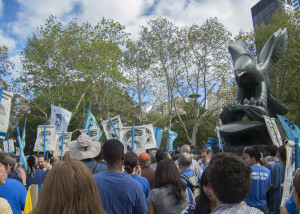 There were scientists and students, anti-fracking and anti-war groups, indigenous people and urbanites, grandmothers and children, medical doctors and social justice activists, celebrities and people from historically under-served communities – waves of people from every walk of life, all of us united in the urgent call to governments and the U.N. to take strong action for climate justice and sustainability. The signs that people carried were as diverse as the people carrying them: funny and poignant, angry, sad, and quirky. 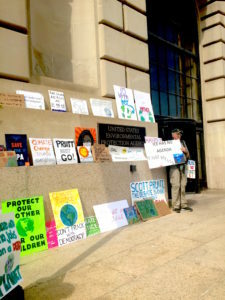 At least two writers created poetry from the signs’ messages, including Terry Tempest Williams (The Orion Blog: River Walkers) and a local friend, Nick Grabbe (Adventures in the Good Life: Climate Change Kills Kittens). About 10,000 people marched in our interfaith contingent. So many different faith groups were represented that a thoughtful volunteer created 38 small flags for each group to carry, alphabetized from A-Z (Agnostic to Zoroastrian). All of us marched together: Greek Orthodox and Pagan, Jew and Muslim, Pentecostal and Sikh, Buddhist and Mennonite. A handmade Noah’s ark was stationed alongside an inflated replica of a mosque. (For a photographic essay about the Ark’s journey through the streets, visit “A priest, a rabbi, an imam, and a unicorn got on an Ark to save our planet”). It was alive: filled with energy and generating new possibilities. The march was timed to coincide with the U.N. climate summit in New York, and a host of significant events rose up alongside, like mighty ocean waves. The protesters and the acts of non-violent civil disobedience on Wall Street gave voice this week to everyone who wants a fossil-free economy and an economic system that heals the chasm between rich and poor. The Rockefeller family, whose legendary wealth flowed from oil, announced its decision to divest its $860 million philanthropic fund from fossil fuels. Meanwhile, there are things that all of us can do right away. I invite you to add your voice to a new initiative, OurVoices.net, by which millions of people around the world can register their commitment to pray for the success of the 2015 U.N. climate talks in Paris. The U.N. climate leader, Christiana Figueres, is asking for everyone’s spiritual and moral support of this initiative. Those of us who live in western Massachusetts have an opportunity on Monday evening, October 20, to march to the steps of City Hall in downtown Springfield and to urge City Councilors to pass a resolution calling on the city to create a strong climate action plan (for updates, please check Climate Action Now). Faced with a crisis that threatens all living beings, human and non-human alike, will humanity unite at last to create God’s dream of Shalom and to form the beloved Earth Community? Will we respond at last to the call to organize, strategize, and mobilize? I take heart from the prophet Isaiah, who perceives God as coming to us from the future, making all things new. God speaks through Isaiah, saying: “Do not remember the former things, or consider the things of old. I am about to do a new thing; now it springs forth, do you not perceive it?” (Isaiah 43:18-19). The planet is rapidly warming. Species are going extinct. Sea levels are rising. But another kind of ocean is rising, too: an ocean of love and concern, an ocean of commitment and resolve that is bringing together all kinds of people who are willing to engage in the struggle for a just and habitable world. I will remember September 21, 2014, as a day when humanity said Yes. In the days ahead we will have plenty of opportunities to repeat that Yes, again and again, with our lips and in our lives. We have a long struggle ahead of us. I hope that all of us will discover what it’s like to rise up like an ocean, deep and wide and alive. 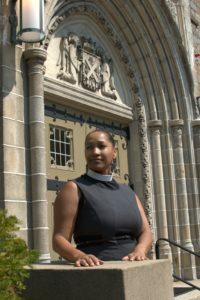 To view some of the plenary sessions and workshops from the conference “Religions for the Earth,”held at Union Theological Seminary from Sept. 19-21, 2014, and sponsored by Union Theological Seminary, the World Council of Churches, and several other major religious organizations, go here. To view the multi-faith service held on Sept. 21, 2104, at the Cathedral of St. John the Divine, which served as the finale of the “Religions for the Earth” conference, go here. 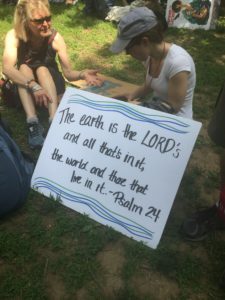 At the service, religious and spiritual leaders from around the world joined with activists, artists, scientists, community leaders, and government officials in a ritual of covenant and commission to protect and care for the Earth. Speakers included Former Vice President Al Gore, Rev. Jim Wallis, Chief Arvol Looking Horse, Dr. Vandana Shiva, Rabbi Ellen Bernstein, and more. The man who prayed to the ancestors is Uncle Angaangaq Angakhorsuaq, Founder, IceWisdom International/Eskimo-Kalaallit Elder. The man dedicated to civil and human rights is the Rev. Dr. Gerald Durley, Pastor Emeritus, Providence Missionary Baptist Church.